I met Paul Mort in a business mastermind almost a decade ago. At the time, he was a personal trainer running boot camps in England and had built it up to 17 locations. He was brilliant — but at the same time — crazy, and a roller coaster. Throughout the years we became close friends as I watched him build and sell companies, all while struggling personally with bi-polar disorder – which wrecked havoc on his health and family. This all came to a climax when in 2014 he was on the edge of a cliff ready to jump and take his own life. What happens next is not only incredible, but also inspirational. As Paul took the step back, he made the decision to turn his life around in every way. He has since became unstoppable in the areas of business and fitness. He also saved his marriage and family. Today he is off the lithium medication and helping other men turn their lives around. 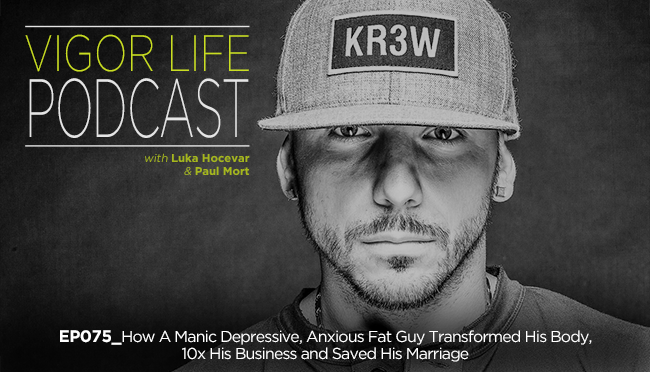 Paul came and visited me in Slovenia to hang out for three-days and we decided to shoot this podcast because his story is too powerful — and full of lessons that I believe will help others transform — not to. This entry was posted in Podcasts and tagged Body Transformation, Fitness, Fitness Business, Performance, Personal Development, Self Development, Self Help, Self-Esteem, Success, Transformation, VigorLife. Bookmark the permalink.